It’s a bit of an understatement to say that video games haven’t exactly translated well onto film in the past. 2016 could be the year all that changes with Michael Fassbender and Marion Cotillard’s Assassin’s Creed and the Duncan Jones-directed Warcraft. I’m so happy there’s a second trailer out for the film if, for no other reason, I’ve been seriously pounded with the first one in every movie I’ve attended for months. Azeroth looks fully-realized and Warcraft a totally immersive fantasy film. What troubles me are the humans. The acting…is not stellar in the trailers. So can the world and the story overcome a mediocre cast, or are we just going to have to wait for Fassbender to assassinate the video game/movie curse this fall? Warcraft opens June 10, 2016. It’s a bit of an understatement to say that video games haven’t exactly translated well onto film in the past. 2016 could be the year all that changes with Michael Fassbender and Marion Cotillard’s Assassin’s Creed and the Duncan Jones-directed Warcraft. BlizzCon gave us our first look at the latter film, based on the MMORPG World of Warcraft and it’s nothing short of jaw-dropping. If they can capture the story and world (because the look they have COLD) that has kept millions of gamers wandering the world of Azeroth for a decade then 2016’s summer just got a new must-see film. This trailer is flat out fantasy joy. The organizers have the events broken down by days from July 23 – July 27 and a scheduling tool that, if you’re brave enough to venture into the maw of raw geekdom, will help you plot out the best use of your time. It’s always a busy time with a lot of announcements and I’ll try to keep the site updated with the biggest and then do daily wrap-ups with all of the poster and promotional art that will be coming out. 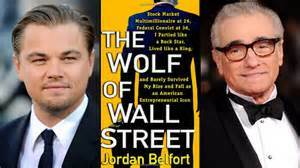 The Wolf of Wall Street made a brief foray into 2014 from it’s original release date (which was this Friday). Then, once Monuments Men left a gaping hole in the Oscar race, the Scorcese financial thriller came back into 2013 and will now open on Christmas Day. I have no idea what to think about this one. Sometimes to cheer myself up, I’ll watch the buck-toothed Matthew McConaughey pound his chest in the first trailer. I suggest it for quick therapy. Official synopsis below. Killing Time’s favorite film of the year so far, Now You See Me, is getting a sequel. The end of the movie certainly left the gate open for further adventures, but I hope they take they time to craft a story as clever and fun as the first is. This is what Coming Soon had to say: “As the summer comes to a close, studios are already looking back at what worked and what didn’t and for Lionsgate and Summit Entertainment, one of their big summer successes was the Louis Letterier-directed magical heist movie Now You See Me, starring Jesse Eisenberg, Woody Harrelson and Isla Fisher. It has grossed $115.6 domestic and $119.3 million internationally based on a reported production cost of $75 million. According to The Hollywood Reporter, Lionsgate CEO Jon Feltheimer told analysts on Friday that the success of one of the summer’s few movies that isn’t a sequel and isn’t based on an existing property already has the company talking about a sequel with plans to start production as early as 2014. There’s no additional information about whether they already have a writer working on a screenplay, whether director Louis Letterier might return to direct or how much of the original ensemble cast were signed to multiple picture deals and might return, but if you happened to have seen the movie then you know that there are definitely some interesting ideas that they could explore in a sequel.